As an update from yesterday's news of a fire breaking out on a superyacht at the Benetti shipyard in Livorno, Italy, Benetti has released an official statement. The Italian yacht builder affirms that the fire broke around the morning of August 20 around 7 a.m. at the Morosini dock located inside the Livorno boatyard aboard the nearly finished Benetti FB261 motor yacht. The yacht was in its final stages of construction. The fire was extinguished by 5 p.m. and no injuries were reported. 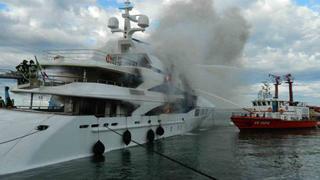 The extent of the damage has not been reported by Benetti, but photos show that, unfortunately, the yacht fire had spread to multiple decks before being extinguished.